Enormous, often serpentine animals reported in the ocean worldwide, both near coasts and on the high seas. It is probable that many different types of animals—known and unknown—are responsible for sightings, making it extremely difficult to extract a uniform description. Scientific names: Halsydrus pontoppidani, given by Patrick Neill in 1809; Megophias mon-strosus, first proposed in 1817 by Constantin S. Rafinesque and modified to Megophias megophias in 1892 by A. C. Oudemans; Pelamis monstrosus, also suggested by Rafinesque in 1817 for another variety. Variant names: Beisht kione (Manx), Bled-mall (Irish), Cirein croin (Gaelic, "gray crest"), Great sea-serpent, Great unknown of the seas, Mester stoorworm (Orkney Islands), Physeter (Greek, "the blower"), Sea serpent, Sjo-orm (Norwegian, "sea worm"), Sjo-orm (Swedish), Tennin (Arabic/Semitic, from the Hebrew tan, "monster"). Physical description: Characteristics are so variable that it is necessary to refer to the schemes proposed by authors who have attempted to cat alog and classify some specific types. The most important are those by A. C. Oudemans, Bernard Heuvelmans, Paul H. LeBlond and John Sibert, and Gary Mangiacopra. Oudemans type: In 1892, the Dutch zoologist Anthonie Cornelis Oudemans examined 162 reports of Sea serpents between 1522 and 1890 and concluded that most of them could be explained by a single hypothetical animal—specifically, a long-necked SEAL, 50-100 feet long, with a serpentine tail, four flippers, large eyes, a mane, and whiskers. Christening it Megophias megophias, Oudemans thought such an animal (for which there is no evidence in the fossil record) could equally explain sightings of long-necked animals, elongated animals with many humps, and serpentine animals. As Heuvelmans commented later, Oudemans erred by not admitting that there could be more than one kind of Sea monster. (1) The LONGNECK, a mammal with a long, slender, flexible neck similar to that of some Freshwater Monsters reported in lakes and rivers. Heuvelmans classified this as an extremely elongated SEAL adapted for a purely marine existence. (2) The Merhorse, a mammal with a horselike head and large eyes, also classified as a seal adapted for semiabyssal depths. (3) The Multihumped Sea Monster, a mammal with a string of dorsal humps forming a ridge on its back. Heuvelmans took this to be an archaic CETACEAN, such as the especially elongated family of basilosaurids, or an early cetacean from a group not found in the fossil record. (4) The Multifinned Sea Monster, a mammal with lateral, finlike projections on both sides of its body, also taken by Heuvelmans to be an early whale of some type. mammal with a distinct head and a tapering tail, possibly an archaic whale earlier in the cetacean lineage than the basilosaurids. (6) SUPER-EELS, which comprise at least two kinds of serpentine FISHES with tapering tails, one mottled and another dark above and light below. Heuvelmans was led astray by his assumption that the 6-foot leptocephalus found by the oceanographic research vessel Dana in 1930 represented the larval stage of a huge eel. In addition to giant, eel-like bony fishes, he also postulated a large, serpentine shark similar to the Frill shark (Chlamydoselachus anguineus), primarily to accommodate CAPTAIN Hanna's Fish. (7) The Marine Saurian, a huge, seagoing Crocodilian, possibly a surviving, long-snouted thalattosuchian reptile or a surviving mosasaur. (8) The Father-of-All-the-Turtles, an enormous, unrecognized species of oceanic Turtle. (9) The Yellow-Belly, a yellow, tadpole-shaped tropical animal that might be either a Fish or an Amphibian. Not all of Heuvelmans's categories and identifications have stood up well over time. His assumption that the reptilian plesiosaurs must have been cold-blooded is now seen as not so strict a requirement, leaving open the possibility that the LONGNECK or MERHORSE could be explained as a marine reptile rather than a hypothetical seal. His theory that early whales (basilosaurids) had armored plates is now regarded as incorrect. CETACEAN taxonomy has undergone much evolution since the 1960s, with recent molecular studies showing whales to have emerged either directly from the artio-dactyls (cattle, deer, and pigs) or indirectly through the mesonychids, the first large postdi-nosaur Hoofed Mammals. Also, doubt has been cast on his SUPER-OTTER as an accurate description of Hans Egede's classic sighting. Ulrich Magin contends that Heuvelmans had difficulty assigning many detailed sightings to a particular category and would often shoehorn a report into a category based on geographic location alone. tions, which he sorted into three categories similar to those of Heuvelmans—Long-necked (8.6 percent), Eel-like (26.2 percent), and Multi-humped (14.5 percent)—in addition to unidentified animals (28.2 percent) and unclassifiable animals (22.5 percent). LeBlond and Sibert types: In 1973, oceanogra-phers Paul H. LeBlond and John Sibert looked at 30 CADDY sightings and strandings off British Columbia, Canada, from 1892 to 1969 and identified three kinds of animals, the first two being the commonest. (1) An animal similar to Heuvelmans's LONGNECK, with small eyes and horns on the head, except it appears to have a mane. (2) A large-eyed animal like Heuvelmans's MERHORSE but without a mane. (3) A coiled, serpentine animal somewhat like the MULTIHUMPED Sea MONSTER, with a jagged fin along its back and a sheeplike head. (1) The DORSAL FINNER, roughly comparable to Heuvelmans's MULTIHUMPED SEA MONSTER. Mangiacopra seemed to have dropped this category when he went on to look at twentieth-century reports. (2) The Maner, a ringer for the MERHORSE. (3) A HORN HEAD, probably the same as the LONGNECK. (4) A MULTICOILED SEA MONSTER, which Mangiacopra equated with Heuvelmans's SUPER-EELS, though the similarity seems forced. While there are some differences, this animal seems closer to the MULTIHUMPED SEA MONSTER. Mangiacopra apparently gave up on these categories, as sightings (especially after 1947) seemed to offer poor fits. 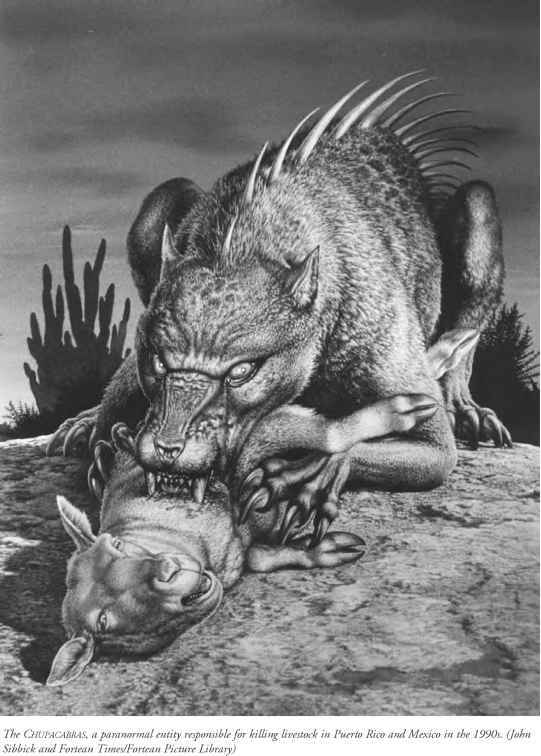 In general, post-1947 descriptions resemble the Multicoiled animal but with different body proportions. Significant sightings: In the ancient and medieval world, Europeans had vague notions of the existence of large marine animals based on classical myths, travelers' tales, dragon legends, and zoological fables. The best known were the Leviathan of the Bible and the Laocoon Serpent and KETOS of the Greeks. 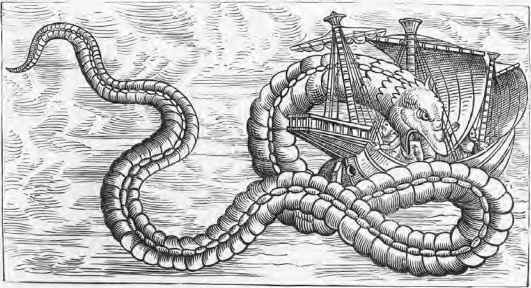 In 1554, Olaus Magnus wrote that sailors often encountered an enormous black Sea serpent 200 feet long and 20 feet thick in the fjords off Bergen, Norway. In 1687, a Sea serpent was seen in calm weather by a group of eleven people in the Dramsfjorden south of Oslo, Norway. It took "some time in stretching out its many folds." In August 1746, Capt. Lorenz von Ferry and his crew came across a Sea serpent off Molde, More og Romsdal County, Norway. They rowed close to the animal, and von Ferry fired at it with his ship's gun, whereupon it sank out of sight. It had a horselike head, large black eyes, and a white mane. The body consisted of seven or eight coils. On August 6, 1848, Capt. Peter M'Quhae and officers of the HMS Daedalus saw a 60-foot serpentine animal in the South Atlantic Ocean about 300 miles off the coast of Namibia. It kept its head and short neck about 4 feet above the surface of the water. The animal moved at a steady speed in the water and was about 600 feet away at the closest point. The color was dark brown, with yellowish-white on the throat. A horselike mane or dorsal fin was visible on its back. They watched it for five minutes with the naked eye and fifteen more minutes through a spyglass. The British ship Imogen was in the mid-North Atlantic about 1,000 miles west of the Canary Islands on March 30, 1856, when the crew noticed a long wake about 400 yards to starboard. Through a telescope, it appeared to be a Sea serpent about 40 feet long with a series of humps on its back. As it swam away, it lifted its head several times as if to look at the ship. Commander Hugh L. Pearson and the crew of the royal yacht Osborne encountered a 30-foot Sea monster with a ridge of fins along its back swimming away from their vessel on the early evening of June 2, 1877, off San Vito lo Capo, Sicily, Italy. The fins seemed about 5-6 feet high, the head was bullet-shaped, and there were two lateral flappers about 15 feet long. Alfred Ford Mathews was on the steamer Manapouri on July 14, 1891, when he saw a Sea serpent north of East Cape, North Island, New Zealand. It raised its head and neck out of the water several times, showing two long appendages, or "armlets," that dangled loosely. On August 18, 1901, First Officer F. Wolfe, in charge of the Chinese customs launch Lung-tsing, was off Tai Yue Shan Island, Hong Kong, when he spotted a coiled serpent in the water with its head raised 2-3 feet in the air. It had a crest on its head and two fins high on the neck. He ordered Second Officer V. Kuster into a gig with some sailors to try to kill it with a boathook. However, the creature struck at one of the oars, raised its head and neck 15 feet in the air, then dived and disappeared. The men estimated it was 40-50 feet long. On December 30, 1947, the Grace Line steamer Santa Clara was in the North Atlantic 118 miles east of Cape Lookout, North Carolina, when officers William Humphreys, John Rigney, and John Axelson saw a snakelike head rear out of the sea about 30 feet off the bow. The body was about 3 feet thick and the head about 5 feet long. The water around the animal was stained red, and it seemed to be thrashing about in agony. John Ridgway and Chay Blyth saw a 35-foot sea animal around midnight on July 25, 1966, during their journey across the North Atlantic in the English Rose III rowboat. The creature dived and passed underneath their boat, surfacing on the other side. On March 2, 1975, Carys Jones and five other schoolgirls walking along the beach at Llanaber, Gwynedd, Wales, saw a 10-foot animal with a long neck, long tail, and large, green eyes walk into the water until it disappeared into the sea. They ran to tell the coast guards, who reported that the girls were extremely upset. On February 5, 1985, Bill and Bob Clark were watching sea lions near Stone Tower Point in San Francisco Bay, California, when they spotted a black, scaly, tubular creature with three to five vertical coils chasing the animals and churning up the water. It had a 30-foot neck and a segmented body, black on top and creamy-white below. It approached the shore and was only 25 yards away from the witnesses, who were able to see many details and estimate its length at 60-100 feet. The Clark brothers saw what was apparently the same animal seven more times, the last time on March 1, 1987, and obtained photos on two occasions. Carcasses: An elongated, 55-foot Sea monster washed up on Stronsay Island in the Orkneys, Scotland, in late September 1808. It had a bristly mane, three apparent pairs of legs, and a small head on a longish neck. The skull, some vertebrae, and one of the legs were examined by John Barclay and Everard Home, who identified the carcass as a Basking shark (Cetorhinus maximus)—but not before Patrick Neill of the Wernerian Natural History Society gave it the scientific name Halsydrus pontopiddani as a new species. Decomposing basking sharks do take on a plesiosaur-like shape due to their enormous gill slits, which practically encircle the head. However, the length of the Stronsay carcass is greater than the largest known basking shark (50 feet); this has led Karl Shuker and Bernard Heuvelmans to suggest that the animal was an undescribed species of giant shark. Other carcasses that probably involved basking sharks were found at Prah Sands, near Pen-zance, Cornwall, England (June 7, 1928); Querqueville, in Normandy, France (February 1934); Hendaye, Pyrenees-Atlantiques Department, France (February 1951); and Skaket Beach, on Cape Cod Bay, Massachusetts (December 1964). In February 1899, a 60-foot monster that washed up on Suwarrow Atoll in the Cook Islands of the South Pacific was examined by the crew of the English steamer Emu. Its head was 3 feet long, and two things like teeth were seen in the lower jaw. The Australian Museum judged it to be a Beaked whale (Family Ziphiidae) decomposed beyond recognition. A 20-foot carcass found at Jehu Sands, near Mumbai, India, in April 1921 was probably a Short-finned pilot whale (Globicephala macro-rhynchus). Charles Moore discovered a Sea monster with a porpoiselike head and a ducklike beak washed up on the rocks at Natural Bridges State Beach near Santa Cruz, California, in May 1925. Its total length was about 35 feet. Two photographs of the carcass were widely distributed in newspapers and magazines. Although the head was undoubtedly that of a whale or porpoise, the narrow, serpentine body and short tail did not seem to correspond. Barton Warren Ever-mann of the California Academy of Sciences visited the spot and obtained the skull, which turned out to be that of a Baird's beaked whale (Berardius bairdii). Some artistic tampering with the remains had apparently occurred for the photographs. Council Officer Charles Rankin observed a stranded carcass at Gourock, Inverclyde, Scotland, in the summer of 1942. It was about 28 feet long, with a long neck, small head, large and pointed teeth, large eyes, a rectangular tail, and two pairs of flippers. There were many bristly hairs in its smooth skin. The remains were summarily buried. At face value, it sounds like this animal was a basking shark, but these sharks have small, hooked teeth. The carcass of a 72-foot monster that washed up on the beach near Tecolutla, Veracruz State, Mexico, in March 1969 most likely belonged to a Sei whale (Balaenoptera borealis). On April 25, 1977, the Japanese trawler Zuiyo Maru dredged up a rotting corpse 30 miles east of Christchurch, New Zealand, that the media portrayed as a plesiosaur. It was 32 feet long and weighed 4,000 pounds. After being photographed, the carcass was dumped overboard to avoid contaminating the ship's catch of fish. Later, tissue analysis at Tokyo University strongly indicated the animal was a Basking shark (Cetorhinus maximus) because of the presence of elastoidin, a protein found in sharks and rays. The apparent lack of a dorsal fin was used as an argument for the carcass being a plesiosaur, but one photo shows an apparent dorsal fin displaced from the center of the back. A bleached, decomposing carcass 19 feet long and 16 feet 6 inches wide washed up at St. Bernard's on Fortune Bay, Newfoundland, on August 2, 2001. The head and tail were missing. The surface of the carcass was rough and fringed with abraded tissue that resembled hair on initial inspection. A molecular analysis determined that the carcass was that of a Sperm whale (Phy-seter catodon). (1) The Oarfish or King of herrings (Regalecus glesne) is the longest of all bony fishes, attaining a length of 36 feet (or unverified lengths of up to 50 feet). Known primarily from dead or dying specimens found stranded or floating, this fish is pale silver with blue streaks. It has a bright red crest on its head that extends into an elongated dorsal fin and two long, narrow pelvic fins that resemble oars. It would be biomechanically impossible for it to extend its head above the water. It is found in warmer waters in the Atlantic, Mediterranean, and Pacific. On January 22, 1860, a 16 foot 6 inch oarfish was found stranded on the rocks of Hungry Bay, Bermuda, and misidentified as a Sea serpent by Captain Hawtaigne of the Royal Navy. (2) The Polka-dot ribbonfish (Desmodema polystictum) is a silvery, deep-sea fish with bright red fins that grows to 3 feet 6 inches. It is found in the Atlantic and western Pacific. (3) The Basking shark (Cetorhinus maximus) can be mistaken for a plesiosaur-shaped Sea monster when it is found stranded and decomposed, as happened with the famous Stronsay carcass of 1808. The gills and lower jaw rot off early, leaving the small skull. The decomposing fins leave behind the ceratotrichia, which are tough, hairlike fibers; the skin also deteriorates into wispy filaments. The lower lobe of the tail drops off before the upper one, which is connected to the backbone. The claspers of the male shark can appear to be legs. The end result is a hairy, plesiosaur-like creature with a small head on a long neck and a narrow tail. The basking shark's longest official length is 32 feet, though unverified specimens up to 50 feet have been reported. Found in both the Atlantic and Pacific Oceans, especially in certain favored coastal locations, the basking shark will enter enclosed bays. Normally harmless unless attacked, it swims slowly at the surface in small groups, feeding on copepods, fish eggs, and other tiny animals. A 30-foot, mucus-covered Sea monster reported by J. P. Jamieson and others in the Shetland Islands in May and October 1903 was probably a basking shark. (4) The Whale shark (Rhincodon typus) is the largest fish in the world. It generally gets no larger than 40 feet, but sizes up to 65 feet 6 inches have been confirmed. Weights up to 22 tons have been recorded. It is found in all warm seas, feeds on plankton, and is very slow-moving and peaceable. (5) The Giant manta ray (Manta birostris) has a broad head with a gaping mouth, hornlike head fins, a wing width of up to 26 feet, and a short, whiplike tail. In the spring and autumn, it leaps out of the water, possibly as part of its mating behavior. It was probably one of these rays that was seen in the harbor at Darwin, Northern Territory, Australia, in October 1959, reportedly flying above the water at 80 miles an hour. (6) The European conger eel (Conger conger) grows to nearly 10 feet long and inhabits the eastern Atlantic, the Mediterranean, and the Black Sea. (7) A snakelike Ribbon moray eel (Rhinomuraena quaesita), like the one that Huguenot refugee François Le Guat caught on the rocks of Mauritius in the 1690s. Discovery in the early 1950s—was probably a large sunfish. (9) A dead or dying Giant squid (Architeuthis) when found floating or washed up on the shore might be mistaken for a Sea monster. Its soft, limp, and slimy mantle could appear to be a snake's cast-off skin or a mane. Henry Lee (in 1883) and Richard Ellis (in 1994) have argued that many, if not most, Sea monster sightings can be attributed to various views of Architeuthis tentacles, arms, and mantles. 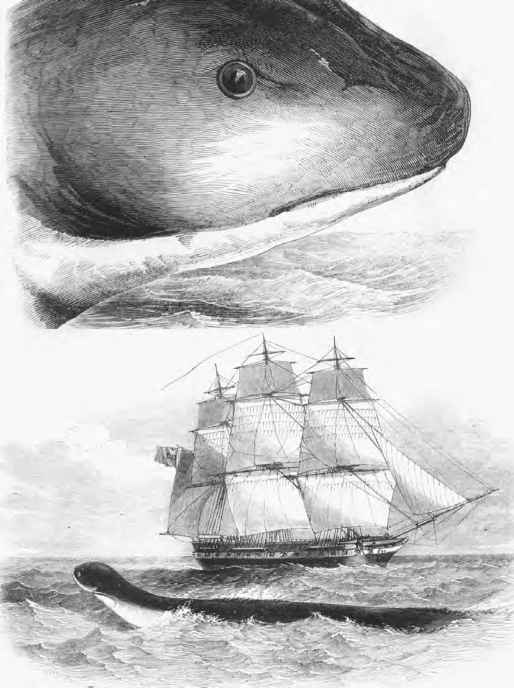 On July 8, 1875, off Cabo de Sao Roque, Brazil, the crew and officers of the merchant bark Pauline witnessed a struggle between a Sperm whale (Physeter catodon) and what seemed to be a huge serpent apparently coiled around it. The serpent was most likely the arms and tentacles of a squid. (10) There are about 900 species of marine Ribbon worms (Phylum Nemertea), but the largest is the dark-brown European nemertine (Lineus longissimus), which commonly reaches lengths of 16-33 feet. It has been known to attain 100 feet, but at that length, it would be less than half an inch thick. The creature that some fishermen of Usan, south of Montrose, Angus, Scotland, took to a local museum in 1849 was probably a 20-foot specimen of one of these worms. (11) Extensive colonies of Sea squirts or Tunicates (Subphylum Urochordata) have been suggested by Roy P. Mackal for some unusual Sea monster sightings. These animals form extended tubes that float at the surface and can reach a length of 33 feet. Each individual in the colony filters nutrients from the surrounding water and squirts out the excess water, resulting in what might seem like an undulating movement. Tunicates in the genus Pyrosoma have organs that contain luminescent bacteria that add an eerie glow to the configuration; those in the Class Salpida have a translucent tunic that is sometimes brightly colored. (12) When traveling slowly, Porpoises (Family Phocoenidae) surface to breathe with a smooth, forward motion. Killer whales (Orcinus orca) make slow, shallow leaps out of the water when swimming fast. Several individuals swimming in line could conceivably be mistaken for the multiple coils of a Sea monster. Killer whale carcasses were mistaken for Sea monsters in Alaska in 1946 and in Malaysia in 1996. (13) A whale might be mistaken for a Sea monster if it appears unexpectedly. However, whales do not have the long necks often reported on Sea monsters. Breaching, blowing, fluking, and diving behaviors are recognizable even to untrained observers. Rorqual whales (Family Balaenopteridae) include the Blue whale (Balaenoptera musculus), one of the largest animals ever to have lived; it generally reaches a length of 78-88 feet, with outsize individuals known to attain 110 feet. Some rorquals are inquisitive and will circle or accompany boats. The square head of the Sperm whale (Physeter catodon) is unmistakable at close range; these animals are generally 40-60 feet long. A Northern right whale (Eubalaena glacialis) was apparently the stimulus for a sighting off Gloucester, Massachusetts, on April 29, 1975, by the crew of the fishing vessel Debbie Rose. (14) The Southern elephant seal (Mirounga leonina) has been suggested by anatomist Richard Owen as the explanation for the Daedalus sighting of 1848. Although it is the largest seal in the world, the male typically averages only 14-16 feet long; the record length is the 22-foot specimen taken off South Georgia Island in 1913, which scarcely comes close to the 60-foot length Capt. Peter M'Quhae observed carefully. (15) The Hooded seal (Cystophora cristata) attains a length of nearly 10 feet. A solitary mammal of the North Atlantic, it often wanders far from its normal breeding and foraging ranges to turn up in unexpected locales, such as up the St. Lawrence River as far as Montreal or as far south as the coasts of Florida, southern California, or Portugal. (16) Sea snakes (Family Hydrophiidae) are completely aquatic, tropical snakes of Australasia and Southeast Asia with paddle-shaped tails that aid in locomotion. Most are only 2—5 feet long; the longest are the Yellow sea snake (Hydrophis spiralis), which grows to 8 feet, and the Stoke's sea snake (Astrotia stokesii), which reaches 6 feet. However, they can be found in large aggregations in calm waters. In the 1930s, Willoughby Lowe observed a solid mass of sea snakes twisted together in the Strait of Malacca; he claimed the mass was 10 feet wide and perhaps 60 miles long. (17) Pythons (Family Boidae) are good freshwater swimmers. They have been found short distances from the coast, but they cannot drink saltwater and probably would not fare well in rough seas. The animal that Third Officer S. Clayton of the Taiyuan saw swimming in the Celebes Sea in the summer of 1907 may have been a very large python, although he put its length at 70 feet, more than twice the length of the largest Reticulated python (Python reticulata). (18) Hoaxes do exist. Newspapers in the nineteenth century were unashamed about making up humorous Sea serpent stories; dubious letters to the editor were also published, such as the facetious account of the steamer Dons August 1881 encounter with a monster that Le Monde Illustré ran, accompanied by a wildly fanciful illustration. The color photo of a 70-foot Sea serpent taken by Robert Le Serrec off Hook Island, Queensland, Australia, on December 12, 1964, has not held up under scrutiny and apparently shows a huge mass of plastic or cloth shaped to look like a monster; Le Serrec's narrative was also problematic, and there is some evidence of a premeditated financial scam. 1,000 feet in length or longer. On December 28, 1848, the ship Pekin was becalmed in the South Atlantic when Capt. Frederic Smith and the crew spied what looked like a long-necked, maned Sea monster; when a ship's boat drew alongside, however, they realized it was a 20-foot clump of seaweed. In the 1850s, surgeon Arthur Adams was on a ship in Bo Hai Gulf, China, when the crew thought they saw a 12-foot snake swimming against the tide; unfortunately, it turned out to be a gnarled tree root caught in a fishnet. (20) A flock of birds skimming the water for fish can look serpentine from a distance, at least temporarily. (21) Other animals that could pose as Sea monsters include the Lion's mane jelly (Cyanea capillata), Deal fish (Trachipterus arcticus), Atlantic salmon (Salmo salar), Giant grouper (Epinephelus lanceolatus), Swordfish (Xiphias gladius), Atlantic halibut (Hippoglossus hippoglossus), Atlantic sturgeon (Acipenser oxyrhynchus), Saltwater crocodile (Crocodylusporosus), Leatherback turtle (Dermochelys coriacea), Komodo dragon (Varanus komodoensis), Anaconda (Eunectes murinus), and a swimming Asian elephant (Elephas maximus). (22) A surviving plesiosaur, a member of a group of marine reptiles that swam with paddlelike limbs, has long been a popular Sea monster candidate. Some species had long necks, and body length varied from 6 to 46 feet. The eyes tended to point upward, and the neck had limited vertical movement, making the head-and-neck posture of many Sea monsters and Freshwater Monsters unlikely. Plesiosaur fossils are found continuously from the Middle Triassic to the end of the Cretaceous, 238-65 million years ago, though there was a smaller extinction at the end of the Jurassic, 144 million years ago, that resulted in a reduction in diversity. 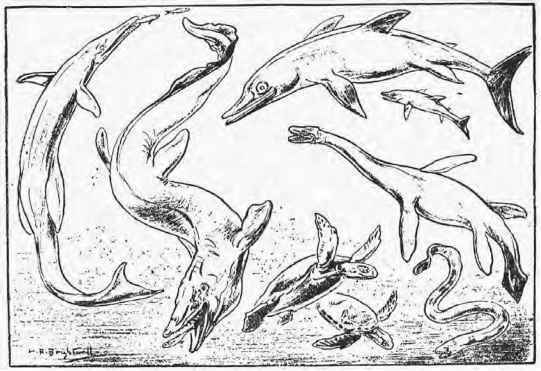 The animals swam either like sea lions, using a downward and backward stroke; or like sea turtles, using a figure-eight stroke that generated lift as well as forward motion. The long-necked forms were probably slower swimmers that ambushed fishes from below. Fossils have been found from every continent, including Antarctica. The first person to suggest that the Sea serpent might be a plesiosaur was apparently Yale University geologist Benjamin Silliman, in 1833. (23) A surviving basilosaurid whale, a member of a family of archaic whales that lived 42-33 million years ago in the Middle to Late Eocene, is another frequent contender for Sea monster identity. These animals were torpedo-shaped and had flexible and elongated vertebrae, huge skulls more than 3 feet long, curved front teeth, serrated cheek teeth, flexible necks, twin flippers derived from forelegs, small dorsal fins, and long, fluked tails. The hind limbs, about 2 feet long in Basilosaurus isis, were reduced but functional. Nostrils were located at the top of the snout. Unlike modern whales, the teeth were differentiated into incisors, canines, and molars. Basilosaurids came in a wide range of sizes, from 6 to 82 feet long. They are known to have inhabited shallow coastal waters and swamps as well as open oceans. Fossils have been found in Egypt (especially in Zeuglodon Valley), India, and North America. 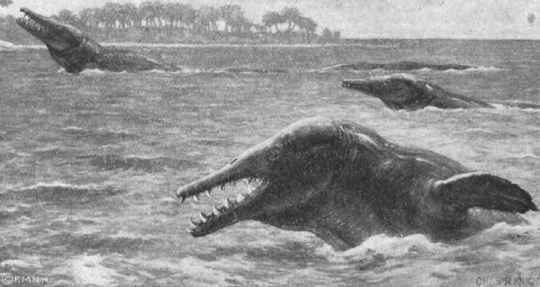 The first person to suggest that the Sea serpent might be a basilosaurid was apparently the German botanist Matthias Jakob Schleiden, in 1847. (24) An enormous marine salamander of some type, suggested by Malcolm Burr. (25) Bernard Heuvelmans and others have had to postulate animals not known from the fossil record to account for many Sea monster characteristics. See the specific types listed earlier in this entry. G. Smith and Gary S. Mangiacopra, "The Professor Sharpe Sea-Serpent Photograph: A Preliminary Report of Its Historical Background," Crypto Dracontology Special, no. 1 (November 2001): 26-33; Bruce A. Champagne, "A Preliminary Evaluation of a Study of the Morphology, Behavior, Autoecology, and Habitat of Large, unidentified Marine Animals, Based on Recorded Field Observations," Crypto Dracontology Special, no. 1 (November 2001): 93-112; Steven M. Carr, H. D. Marshall, K. A. Johnstone, L. M. Pynn, and G. B. Stenson, "How to Tell a Sea Monster: Molecular Discrimination of Large Marine Animals of the North Atlantic," Biological Bulletin 202 (2002): 1-5.